The Fine Arts Quartet lives! Their return to Milwaukee depends upon you. For 55 years, the Fine Arts Quartet has performed in Milwaukee contributing to the cultural life of our city. As university support ends, private funding is needed for the Quartet to continue performances in Milwaukee. The Friends of the Fine Arts Quartet are leading a campaign to finance a Festival in June. We invite you to contribute to the inaugural season of the community-sponsored Fine Arts Quartet series. We are thrilled to announce that the Quartet will perform at the UW-Milwaukee Zelazo Center on June 15 and 17! We will announce additional events as June approaches. We are raising the funds to cover the costs of staging the June 2018 Festival concerts. The concerts will be free to the public. The future of the Fine Arts Quartet remains solid. 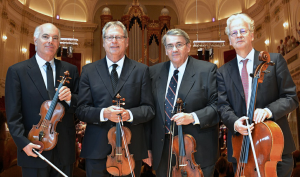 In February, violist Gil Sharon and cellist Niklas Schmidt joined the Quartet. Each brings extensive, impressive credentials as chamber music performers on the international scene. As frequent guest artists with the Fine Arts Quartet, they share the unique musical vision of the Quartet. In fact, the Quartet has already been engaged for twenty-four concerts around the world into 2019. Saint John’s on the Lake is partnering with the Fine Arts Quartet in the Festival. They have created an account to receive funds for the events. Contributions to the Saint John’s on the Lake – Fine Arts Quartet Festival Fund are tax-deductible. All of us who have loved the Fine Arts Quartet performances through the years need to step forward to complete the campaign. The level of funding in 2018 and the breadth of participation will also be critical as we look forward to future Milwaukee concerts of the Fine Arts Quartet in 2019 and beyond. In addition to commitments from those of you able to become “champions,” 0ur goal is to raise an average of $100 each from 100 friends of the Quartet. Contributions of any amount are appreciated. Those who contribute $300 or more will be invited to a private event in June. Fill out all relevant information. On the Saint John’s Foundation site, enter “Fine Arts Quartet Festival” on the Special Project line. You may charge your donation on a credit card at this site. To mail a contribution: Make out a check to: “Saint John’s on the Lake“, write on the memo line: “Fine Arts Quartet Festival”, and mail it to: Saint John’s, Office of Philanthropy, 1840 N. Prospect Ave, Milwaukee, WI 53202. Please download the attached donation form to send in with your check or credit card information.